We’re sure you know who an NRI is, but let’s take a closer look at how our laws precisely define the term. 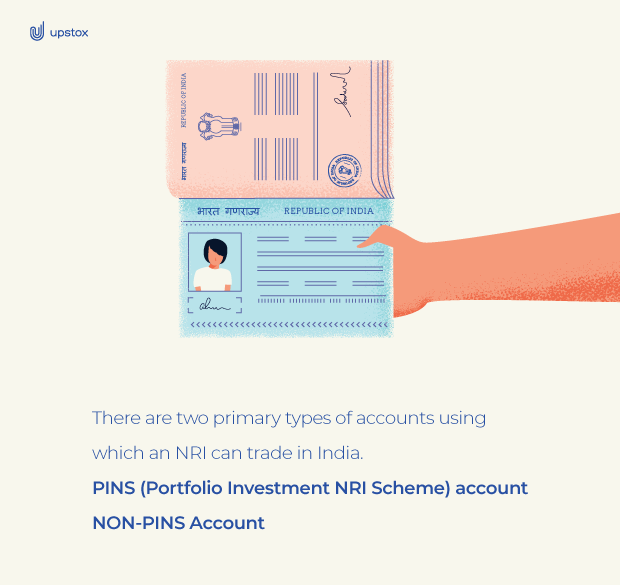 There are two major types of demat accounts using which an NRI can trade in India: a PINS (Portfolio Investment NRI Scheme) account and a non-PINS account. A citizen will also be called an NRI if she/he stayed less than 182 days in India during the preceding financial year. As per India’s Foreign Exchange Management Act of 1999 (FEMA), an NRI is an Indian citizen or a foreign national of Indian origin, who is residing in foreign lands for the purpose of employment, business or due to some other circumstances. A citizen will also be called an NRI if she/he stayed less than 182 days in India during the preceding financial year. An NRI is by no means an ‘outsider’ though. For the longest time, remittances from NRIs abroad have been an important source of funds for the Indian economy. In fact, special instruments have been designed for NRIs, allowing them to invest and trade in securities in India. Like any other resident Indian, an NRI will also require a demat account for holding and storing stocks, bonds, futures & options, or any other financial asset in India. It won’t be a typical demat account though. Instead it’ll be one that is specially crafted to suit the needs of NRIs. This scheme will allow you to trade in equities and shares in the Indian share market. The PINS account can be further classified into Non-Resident Ordinary (NRO) or Non-Resident External (NRE) accounts. An NRE PINS account allows your funds to be repatriated to your foreign country whereas funds from the NRO PINS account have to remain within India. This scheme is used to invest in Initial Public Offerings (IPOs) and mutual funds. This can also be further classified into Non-Resident Ordinary (NRO) or Non-Resident External (NRE) accounts. Similar to PINS, an NRE account allows your funds to be repatriated to your foreign country whereas an NRO account does not allow this. Trading in derivatives too is possible with a non PINS account, provided you use a CP (Custodian Participant) Code. There are a lot of benefits up for grabs from demat accounts designed for an NRI. A demat account will allow you to trade and invest in your motherland’s economy. All your investments in the stock market will be automatically updated in your demat account. It will save considerable time, and you can manage all your securities with ease. With an NRE demat account, you can bring your funds back to the country you reside in. You will not have to visit India each and every time you want to trade. Your first step will be to choose a Depository Participant (DP), or a brokerage firm like Upstox, which is authorised by the SEBI. Your broker will hand you an NRI account opening form. You can find Upstox’s online NRI registration page here. Fill in this form, and attach a proof of identity and a proof of address. For online Aadhaar based registrations, simply upload scanned copies and enter your Aadhaar card details. Once done, you’ll be expected to sign an agreement with your broker. This document will state your responsibilities as a trader/investor, and that of your brokerage’s. Once the document processing is complete, you’ll be given your demat account number, similar to how we receive a bank account number when opening an account. A copy of your valid visa. Overseas address proof Address proof of your work place. You are required to submit these documents along with the demat account application form. The significance of an NRI demat account to trade back in India is probably clear to you by now. Like resident Indians, NRIs too can open a demat account to trade in Indian securities. After the regular form filling and document submission procedures, you can go ahead and open your NRO or NRE demat accounts.